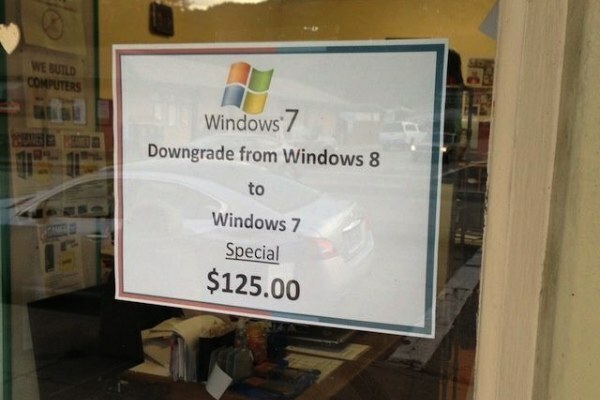 If you had to put a price on how much you hate Windows 8, what would that be — $10, $20 or $50? At least one Windows PC integrator has put a price on it and, wow, if you can’t do it yourself, removing Windows 8 from your new notebook won’t come cheap. Although Microsoft claims it has “sold” 60 million Windows 8 licenses, only a tiny percentage of those sales were to willing buyers (i.e. people that purchased upgrades or standalone copies). The huge majority of Windows 8 sales are in fact OEM licensed copies installed on new PCs. That said, the thing people hate about Windows 8 is that it isn’t like previous versions of Microsoft’s ubiquitous operating system. Which is kind of odd given that, with a few well placed tweaks, Windows 8 can be made to work just like Windows 7. Seriously, their new operating system is mostly their old operating system with a disjointed touch UI pasted on top. Nevertheless, if you don’t know how to tweak it and/or can’t get rid of it on your own, at least one PC integrator will install Windows 7 on your new PC for you. The catch? It will cost you $125 or about $30 more than the current street price for Microsoft’s last-gen desktop operating system. Is $125 a fair price or would you rather just hate Windows 8?